The Queen's Own Rifles of Canada is a Primary Reserve regiment of the Canadian Armed Forces, based in Toronto. The regiment is part of 4th Canadian Division's 32 Canadian Brigade Group. It is the only reserve regiment in Canada to currently have a parachute role. The regiment consists of the reserve battalion, the Regimental Association, and the Regimental Band and Bugles. The official abbreviation is The QOR of C, but the name is often abbreviated to QOR. The Queen's Own Rifles of Canada parade out of Moss Park Armoury in downtown Toronto. The unit motto is In Pace Paratus—In Peace Prepared. The Queen's Own Rifles of Canada are the only Primary Reserve unit in Canada with a parachute tasking. The unit has qualified Parachute Instructors, Drop Zone/Landing Zone Controllers and Jumpmasters. Members also take courses in helicopter operations, aerial delivery, and as Recce and Advanced Mountain Operations Instructors. Members of The QOR have also been sent on the Patrol Pathfinder Course. Qualified personnel in jump positions are allowed the honour of wearing the maroon beret. Trained soldiers are addressed as Riflemen. The Queen's Own Rifles have a long-standing support role with the Canadian Army Advanced Warfare Centre, where QOR parachute instructors and other personnel on staff instruct on and support parachuting courses. The unit currently supplies a company(-) of paratroopers to the 3 RCR parachute company when required. The battalion deploys by parachute on numerous Field Training Exercises during the year and during divisional exercises during the summer. The Canadian Forces SkyHawks Parachute Demonstration Team has also had support from The Queen's Own Rifles of Canada, with several members joining the elite demonstration team. The 2nd Battalion, Volunteer Militia Rifles of Canada was formed on April 26, 1860, predating the Confederation of Canada. Its first commanding officer was Lieutenant Colonel William Smith Durie. During the Trent Affair of 1862, William Mulock asked John McCaul, the head of University College (part of the University of Toronto), to call a student meeting that led to the formation of the University Rifle Company of volunteers, 9 Company of The Queen's Own Rifles of Toronto, later K Company of The Queen's Own Rifles of Canada. University of Toronto professor Henry Holmes Croft was a member and served as Captain. It was re-designated as the Second Battalion Volunteer Militia Rifles of Canada or Queen's Own Rifles of Toronto on 18 March 1863. The Queen's Own Rifles of Toronto were called out on active service from 8 to 31 March and from 1 to 22 June 1866. The battalion fought on the Niagara frontier. The Queen's Own Rifles first saw combat and sustained nine killed in action during the Battle of Ridgeway in 1866, where they and the 13th Volunteer Infantry Battalion (The Royal Hamilton Light Infantry) fell back when charged by a massive force of better armed and highly experienced Fenian insurgents composed of recent Irish American Civil War veterans. 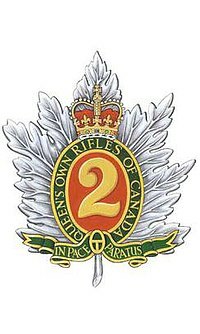 It was renamed as 2nd Battalion, Queen's Own Rifles of Canada on 13 January 1882. The 2nd Battalion, Queen's Own Rifles of Canada mobilized detachments for active service on 10 April 1885 that served with the Battleford Column of the North West Field Force, and were removed from active service on 24 July 1885. It was named the 2nd Regiment Queen's Own Rifles of Canada on 8 May 1900. The Regiment contributed volunteers for the Canadian Contingents, mainly the 2nd (Special Service) Battalion, Royal Canadian Regiment of Infantry. The Second Boer War was the first time that soldiers from the Regiment fought on foreign soil. They were recognized for their service and earned a battle honour for the regiment, even though they were not allowed to wear the QOR cap badge in South Africa. Details of the Regiment were placed on active service on 6 August 1914 for local protection duties. In the First World War, none of the existing militia infantry regiments in Canada were formally mobilized. In 1914 The Queen's Own formed the 3rd Canadian Battalion (Toronto Regiment), CEF. The 3rd Battalion, CEF was authorized on 10 August 1914 and embarked for Britain on 26 September 1914. It disembarked in France on 11 February 1915 and fought as part of the 1st Infantry Brigade, 1st Canadian Division in France and Flanders until the end of the war. The battalion was disbanded on 30 August 1920. Later in the war, The Queen's Own Rifles recruited for additional Canadian Expeditionary Force battalions, which did not enter combat as units, but supplied reinforcements to the Canadian Corps. The 83rd Battalion (Queen's Own Rifles of Canada) was authorized on 10 July 1915 and embarked for Britain on 28 April 1916. It provided reinforcements for the Canadian Corps in the field until 7 July 1916, when its personnel were absorbed by the 12th Reserve Battalion, CEF. The battalion was subsequently disbanded on 21 May 1917. The 95th Battalion (Queen's Own Rifles of Canada) was authorized on 22 December 1915 and embarked for Britain on 31 May 1916. It provided reinforcements for the Canadian Corps in the field until 24 January 1917, when its personnel were absorbed by the 5th Reserve Battalion, CEF, and was disbanded on 17 July 1917. The 166th Battalion (Queen's Own Rifles of Canada) was authorized on 22 December 1915 and embarked for Britain on 12 and 17 October 1916. It provided reinforcements for the Canadian Corps in the field until 8 January 1917, when its personnel were absorbed by the 12th Reserve Battalion, CEF. The battalion was disbanded on 15 September 1917. The 198th Battalion (Canadian Buffs) was authorized on 15 July 1916 and embarked for Britain on 28 March 1917. It provided reinforcements for the Canadian Corps in the field until 9 March 1918, when its personnel were absorbed by the 3rd Reserve Battalion, CEF. The battalion was then disbanded on 29 November 1918. The 255th Battalion (Queen's Own Rifles of Canada) was authorized on 1 May 1917 and embarked for Britain on 6 June 1917. On 12 June 1917, its personnel were absorbed by the 12th Reserve Battalion, CEF to provide reinforcements for the Canadian Corps in the field. The battalion was disbanded on 1 September 1917. The Queen's Own Rifles have perpetuated the traditions and battle honours of the 3rd Battalion, 83rd Battalion, 95th Battalion, 166th Battalion, 198th Battalion, and 255th Battalion, CEF. Both the QOR and The Royal Regiment of Canada perpetuate the 3rd Battalion. It was designated "The Queen's Own Rifles of Canada" on 1 May 1920. The regiment mobilized for active service on 24 May 1940. It was then redesignated as the 1st Battalion, The Queen's Own Rifles of Canada, CASF on 7 November 1940. The unit served in Newfoundland (at the time a separate Dominion) in the defence of two strategic airfields at Botwood and Gander in Newfoundland from 10 August to 15 December 1940. After a build-up and training period, the unit embarked for Britain on 19 July 1941. The regiment mobilized the 3rd Battalion, The Queen's Own Rifles of Canada, CASF for active service on 12 May 1942. It served in Canada in a home defence role as part of the 20th Infantry Brigade, 7th Canadian Infantry Division. The battalion was disbanded on 15 August 1943. The 2nd Battalion, commanded by LCol W.H.V. Matthews served in Korea following the armistice from 26 March 54 to 6 April 1955. Rifleman Norman Philip Ferland, 31 March 1954. Lt Neil MacDonald Anderson, 25 August 1954. Sgt Gerald Walter Koch, 4 August 1954. Lt Milton Cameron Vipond 18 March 1955. Rifleman George Peter Reid, 11 June 1955. Maj. Philip Edwin Gower, MC, died on 9 December 1956 while serving with the United Nations Command Military Assistance Commission. As part of the Regular Force, the unit was involved in the Korean War. The Regular Force battalions served on NATO duty in Germany and served on UN duty in Cyprus. The camp flag of the Queen's Own Rifles of Canada. In 1970, with the downsizing of the Canadian Forces, the 1st Battalion of The Queen's Own Rifles of Canada was rebadged as the 3rd Battalion Princess Patricia's Canadian Light Infantry. From 1983 to 1995, the regiment was operationally tasked to provide an airborne company to the Canadian Airborne Regiment. Members of The Queen's Own Rifles of Canada have served on recent overseas deployments including: UNTAG (United Nations Transition Assistance Group) Namibia 1989–1990, Cambodia, Cyprus, Somalia (for Operation Deliverance 1992–1993 members were attached to 1, 2 and 3 Commando of the Canadian Airborne Regiment), Sierra Leone, Bosnia, Kosovo, Afghanistan, Darfur and the Sudan. The unit played a large role in the purchase of the Victoria Cross of Corporal Frederick George Topham in 2005 and its subsequent donation to the Canadian War Museum. On April 22, 2006, The QOR of C opened Dalton Armoury in Scarborough as part of the Land Force Reserve Restructure expansion. Buffs Company parades out of Dalton Armoury. In September 1910, the QOR went on a 13-mile (21 km) route march with The Buffs (East Kent) Regiment of the British Army. It was noted that the Buffs and QOR used the same regimental march, a tune known as "The Regimental Quick Step of the Buffs" composed for The Buffs by Handel. A regimental alliance was made official in 1914. The Queen's Own Rifles of Canada has earned 47 battle honours during its history, which are emblazoned on the Regimental drums (Rifle Regiments do not carry "colours"). The Rt Hon Vincent Massey was appointed Governor General of Canada in 1952. He was the first Canadian appointed to the post, and since then the governor general has always been a Canadian citizen. Massey Hall in Toronto was donated by his family. The Hon Donald Ethell, Lieutenant-Governor of Alberta 2010–2015. Sir John Morison Gibson (January 1, 1842 – June 3, 1929) was a Lieutenant Governor of Ontario. He was a lieutenant during the Fenian Raids, and fought at the Battle of Ridgeway. Sir Hugh John Macdonald was the son of John A. Macdonald, served as a member of the House of Commons of Canada, a federal cabinet minister, and as the eighth Premier of Manitoba. Lieutenant-Colonel The Hon Barney Danson, PC, CC, served with the regiment in Normandy and later served as Minister of National Defence. He is a Companion of the Order of Canada, Canada's highest civilian honour. General Sir William Dillon Otter (3 December 1843 – 6 May 1929) was the first Canadian-born chief of the general staff, the head of the Canadian Army. In 1890, Otter founded the Royal Canadian Military Institute as a body for "the promotion and fostering of military art, science and literature in Canada." He was appointed as the first commanding officer of the Royal Canadian Regiment of Infantry in 1893. Lieutenant-General Charles H. Belzile was a former head of the Canadian Army. Major-General Lewis MacKenzie (born 30 April 1940) is a Canadian retired general and writer. MacKenzie established and commanded Sector Sarajevo as part of the United Nations Protection Force or UNPROFOR in Yugoslavia in 1992. Major-General Malcolm Mercer was a barrister and art patron who practised law in Toronto. He led the 3rd Canadian Division during the first two years of the First World War before he was killed in action at Mount Sorrel in Belgium. He remains the most senior Canadian officer to die in combat. Major-General Sir Henry Pellatt (6 January 1859, Kingston, Ontario, Canada – 8 March 1939) was a well-known Canadian financier and soldier who built Casa Loma. Brigadier General John "Jock" Spragge, DSO, OBE, ED joined as a rifleman in 1925 and rose to become commanding officer of the Queen's Own Rifles on D-Day and in August 1944, Officer Commanding 7th Canadian Infantry Brigade. Lieutenant-Colonel John McCrae is remembered for his poem In Flanders Fields. He was a member of The Queen's Own Rifles of Canada while studying at the University of Toronto, during which time he was promoted to captain. Lieutenant-Colonel Arthur Godfrey Peuchen was a businessman and RMS Titanic survivor. He commanded the Home Battalion of the QOR during the First World War. Major John Hasek was a journalist and author of The Disarming of Canada. He was the first commander of the SkyHawks Parachute Team, and also served in Ghana, Vietnam and Cyprus. Hasek was injured and killed while reporting on the war in Yugoslavia in 1994. Major Ben Dunkelman – Promoted through the ranks from private to major during the Second World War. Saw action at Caen, Falaise, and the Battle of the Scheldt. His father was David Dunkelman, the founder of Tip Top Tailors. Major Edward Arunah Dunlop, Jr. was an MPP and first president of the Toronto Sun. He was blinded during the Second World War while trying to save a soldier from a grenade. Captain and Assistant Surgeon Norman Bethune, Sr., MD was a physician and medical educator who served with the Queen's Own from 1877-1879. His grandson was Henry Norman Bethune, MD, the internationally known physician who doctored in the Spanish Civil War and in China during the Communist Revolution. Lieutenant Norm Gardner, former Chair of the Toronto Police Services Board. Bugle Major Charles Swift served as Bugle Major of The Queen's Own Rifles Bugle Band from 1876 to 1923 - a total of 47 years. Herbert L. Clarke was a well-known American cornet player, feature soloist, bandmaster, and composer who joined The Queen's Own Rifles of Canada Band as a cornetist in 1882. Frederick J. Conboy served as Mayor of Toronto from 1941 to 1944. He joined the unit as a Rifleman during the World War II in response to a government appeal for more volunteers. Rifleman John Andrew Forin, served in the Northwest Rebellion where he kept a diary[permanent dead link] of his experience, later moved to British Columbia where he practised law before serving as a County Judge. John Bayley served as the bandmaster of the Regimental band from 1879-1901. K. Dock Yip, reservist during World War II, first Chinese Canadian to practice law and local activist. Lance corporal Albert Tilson, hockey player and namesake of the Red Tilson Trophy. The Queen's Own Rifles of Canada Regimental Museum and Archives is located on the third floor of the historic Casa Loma château in Toronto. Sir Henry Pellatt, who built Casa Loma, was an ardent supporter of the Regiment, and was knighted in 1905 for his service with the unit. Three non-functioning firearms – a Sten submachine gun, Bren light machine gun and a Bock bolt-action rifle – were stolen during a 2008 break-in. They were later recovered and returned. Two suspects were arrested after police used DNA analysis, fingerprints, and tips from the public to identify them. St. Paul's, Bloor Street Anglican Church in Toronto has been the regimental church of the QOR since 1910. It is located at 227 Bloor Street between Church Street and Ted Rogers Way (which connects to Jarvis Street which is further south). The Cross of Sacrifice located outside the church is dedicated to the members of the QOR that have died in combat. It was built and dedicated after the First World War. The Books of Remembrance are a list of the names of the QOR fallen, and are located in the interior of the church. The books are paraded annually on Remembrance Day Sunday, when the regiment parades to St. Paul’s to attend services. The most recent is the regimental badge carved on the back of one of the pews of the Royal Memorial Chapel at Royal Military Academy Sandhurst. The oldest memorial is the Ridgeway tablet at the Memorial United Church in Ridgeway, Ontario. Ridgeway is also commemorated in a stained glass window at University College, a tablet in the Ontario Provincial Parliament buildings, the Canadian Volunteers Monument in Queen’s Park (west side of Queen’s Park Crescent) and a cairn at Ridgeway. A sandstone monument with Italian marble figures and bronze plaques erected on the University of Toronto Campus was dedicated to those of the Queen's Own Rifles of Canada regiment who were killed in action or who died from wounds defending her frontier in June 1866. The monument was erected by the Canadian Volunteer Monument Campaign of 1866, Committee of Toronto citizens and its chairman, Dr. McCaul, then President of the University of Toronto. The North-West Rebellion of 1885 is remembered by the North-West Rebellion Monument in Queen’s Park (east side of Queen’s park Crescent), the Battleford Column tablet in Moss Park Armoury and a cairn at Battleford, Saskatchewan. The South African War memorial is on University Avenue. An additional tablet is in Denison Armoury. The First World War is commemorated by the Cross of Sacrifice and the shrine containing the Book of Remembrance at St Paul’s Anglican Church. In addition, a tablet is mounted at Moss Park Armoury. The QOR fallen are also remembered in The Buffs Memorial window, Warrior’s Chapel, of Canterbury Cathedral. A plaque was erected to the fallen in the Second World War at the site of the D-Day landing, Bernières-sur-Mer, Normandy, France. A tablet was also placed of a farm building at Mooshof, Germany, where Sergeant Aubrey Cosens, VC, earned his decoration. There are also significant memorials at Le Mesnil-Patry, Anguerny, Anisy (France) and Wons, Rha, Sneek, Doorn, Oostburg, Zutphen (Netherlands). Other lesser memorials also exist. On 16 October 1953, it was amalgamated with the Regular Army 1st Canadian Rifle Battalion and 2nd Canadian Rifle Battalion. The 1st Canadian Rifle Battalion and 2nd Canadian Rifle Battalion became the 1st and 2nd Battalions, respectively, of The Queen's Own Rifles of Canada, while the Reserve component was designated as the 3rd Battalion. On 15 September 1968, the 2nd Battalion was reduced to nil strength and transferred to the Supplementary Order of Battle. On 27 April 1970, the 1st Battalion was reduced to nil strength and transferred to the Supplementary Order of Battle, with most the unit's personnel and equipment transferred to the newly formed 3rd Battalion, Princess Patricia's Canadian Light Infantry (PPCLI), and the Reserve Force battalion automatically became the new home station of the Regiment. ^ ""The Regimental Band and Bugles"". Archived from the original on 2012-07-30. Retrieved 2016-10-05. ^ a b c d e f Canadian Forces Publication A-DH-267-003 Insignia and Lineages of the Canadian Forces. Volume 3: Combat Arms Regiments. ^ "Perpetuation of C.E.F. Units - Infantry - 1st Bn to 50th Bn:". Retrieved 2009-02-07. ^ "Juno Beach - Queen's Own Rifles". Members.shaw.ca. Retrieved 14 August 2014. ^ a b "Shaw Communications". members.shaw.ca. ^ "The Rifleman Online - The QOR of C". Qor.com. Archived from the original on 17 October 2014. Retrieved 22 October 2014. ^ "The Colonel-in-Chief". Archived from the original on 2013-06-19. Retrieved 2016-10-06. ^ "The Queen's Own Rifles of Canada Celebrates its 150th Birthday". Canadafreepress.com. 2010-04-22. Retrieved 2011-03-18. ^ "Spragge, John Godfrey". 16 March 2013. ^ "Albert Tilson". The Canadian Virtual War Memorial. Veterans Affairs Canada. Retrieved 2017-12-26. Chambers, Ernest J. (1901). The Queen's Own Rifles of Canada, a history of a splendid regiment's origin, development and services, including a story of patriotic duties well performed in three campaigns. Toronto: E.L. Ruddy. Retrieved July 22, 2012.